Make healthy, nutritious snacks with no additives or preservatives. 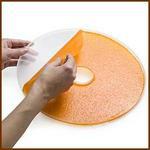 Ideal for making homemade fruit rolls and strips from pureed fresh, frozen, or canned fruit. Designed to fit in all Presto® Dehydro™ Dehydrator trays. Package includes two Fruit Roll Sheets. No service parts are available for this product. A copy of the instructions is available for download by clicking on the link near the bottom of this page.